This handsome pair of grooms were hilarious, and very fun to work with. Their wedding took place at Messina's at the Terminal, which is located at New Orleans Lakefront Airport. The grooms were commercial aviation enthusiasst, so this was a perfect venue for their wedding. We started out with a first look in the main atrium, and were able to get all of our group shots completed before the ceremony. 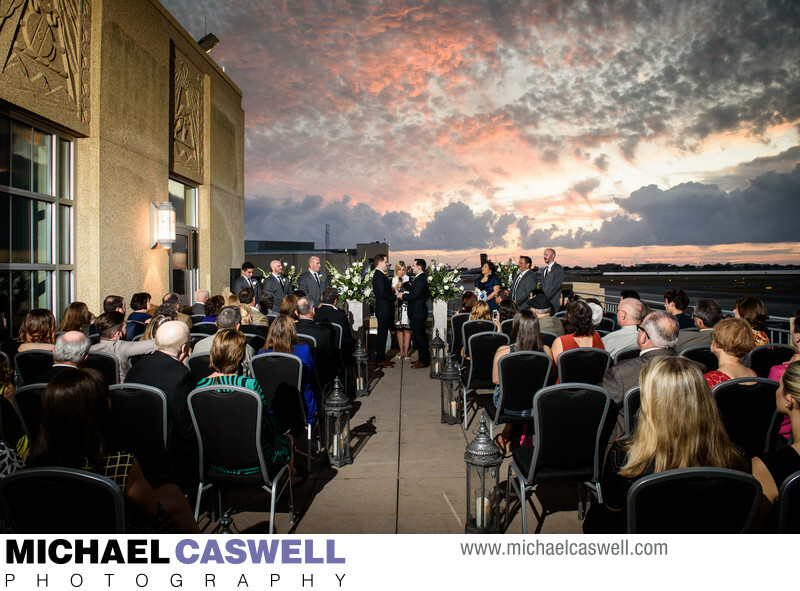 The ceremony took place up on the observation deck, with a wonderful view of the airport and the WWII AirPower Expo which was taking place that weekend, not to mention the glorious sunset that took place directly behind the couple. Ordinarily, I'm not too fond of an outdoor ceremony that takes place at sunset, because in our area they usually occur in enclosed French Quarter courtyards that don't really offer a chance to compose an image that incorporates the pretty sky. In this case, however, the observation deck offered an unobstructed view, and it was breathtaking! We then headed downstairs to the Walnut Room for the reception, where the fabulous Naydja Cojo & The Lagniappe Section were on hand to provide the entertainment (and were joined by a guest or two occasionally as well). Guy & Casey had not one or two, but THREE wedding cakes (made by Cakes by Mindy)! The event was coordinated by Beth's Flowers, who naturally also provided the floral decorations. The New Orleans Lakefront Airport's art deco terminal building dates back to the 1930s, but in the 1950s-1960s was encased in concrete to enable it to function as a nuclear fallout shelter, hiding much of the beautiful design. However, following Hurricane Katrina, the damaged building was not only repaired, but was restored to its original appearance as well, including the uncovering of a treasure-trove of murals on the walls of the atrium, depicting important milestones in aviation. Location: 6001 Stars and Stripes Blvd, New Orleans, LA 70126.